Looking for a universal turnbuckle that can fight against corrosion even in the toughest environment? Our galvanised rigging hardware is perfect for your wall bracing or yard fencing. 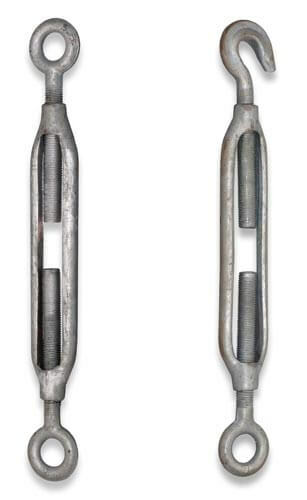 Steel cast turnbuckles come in two types: Eye-eye turnbuckles (left in top image) and hook-eye turnbuckles (right in top image). Our galvanised turnbuckles are intended for the use of non-lifting applications such as guying and rigging of fences and pillars. Just use a d-shackle or wire rope with grips to anchor it. How large is the hook opening on the turnbuckles? The hook opening is the same distance as the Internal Ø shown in the above table. Attaching your turnbuckle to chain or wire rope is relatively simple. With an Eye-Eye turnbuckle you will need a D-shackle to connect it to your chain. If you are using a galvanised wire rope, run the rope through the Eye and loop it over itself, locking it together using wire rope grips. If you are using a Hook-Eye turnbuckle, the hook is designed to hook into on link of a chain. Tip: When you are attached your turnbuckle to a chain or rope, make sure that each end is screwed halfway to give you plenty of room for adjustments.